In Japan, manufacturers produce and supply a wide variety of industrial products at home and abroad as the industrial nation. The industrial products made by the manufacturers are not only completed products such as automobiles and electric appliances but also intermediate products, components and raw materials, which establishes the broad-based supply chain. Various sizes of manufacturers are engaged in producing the completed products, intermediate products, such as components and raw materials at the production lines in in-house factories. In the factories, machines are installed on the production lines with robots for automation, and electric equipment, tools, pneumatic and hydraulic equipment, and manually operated tools. 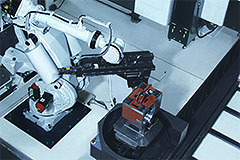 The product lines from Machines and its related-maintenance supplies and consumable supplies, equipment and tools and power source in each category, automation materials, to indirect materials are inevitable factors in the production factories operating all over Japan as the industrial nation. Machines and facilities like automation materials, industrial equipment such as consumable supplies and tools, and indirect materials are smoothly distributed in the supply chain in machines and industrial tools industry. G-net in Furusato group plays a role to distribute supplies in order to produce the industrial products efficiently, working effectively with many domestic and overseas machines and tools manufacturers and retailers to sell to end-users. Especially, G-net invests management resources proactively in measures to improve productivity and efficiency by obtaining high recognition through appropriate explanation of supplies and methods that users are not aware of. We make efforts in the aim of providing customized support by taking measures for each transaction with a great care, together with so-called “simple” method responding to needs by system investment with easy order system to order specified supplies in an easy way.